When I planned the bedroom I had intended to make a walk-in closet in the room to display my wonderful collection of shoes, handbags and couture fashion (OK, that last one still only exists in my mind, but it will happen one day). I haven't had a chance to take photos of the shoe cabinets in their full glory, but you can sneak a peek on the photos below. 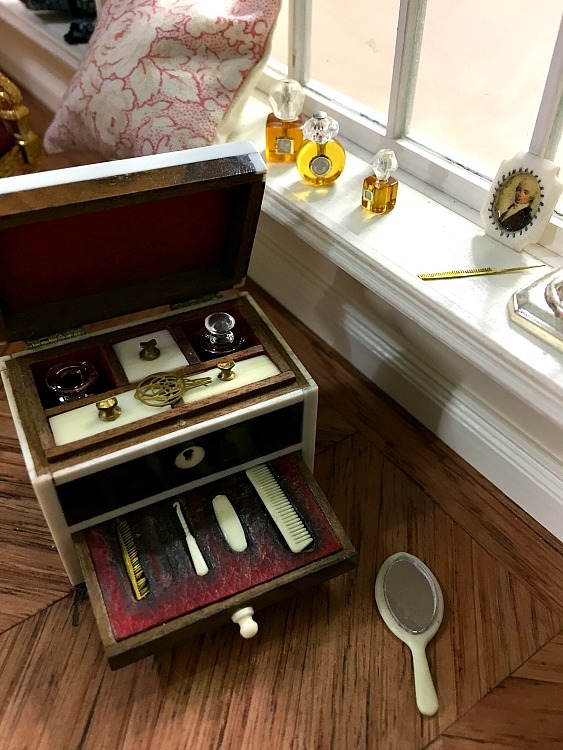 The beautiful walnut burr and ivory vanity box with accessories was made by the wonderful Tony of Miniature Treasures. The walnut is 18th century and the ivory comes from recycled piano keys. At the Arnhem show last October I bought another little treasure, this one from Ilona Kraassenberg of MiniMumLoon. 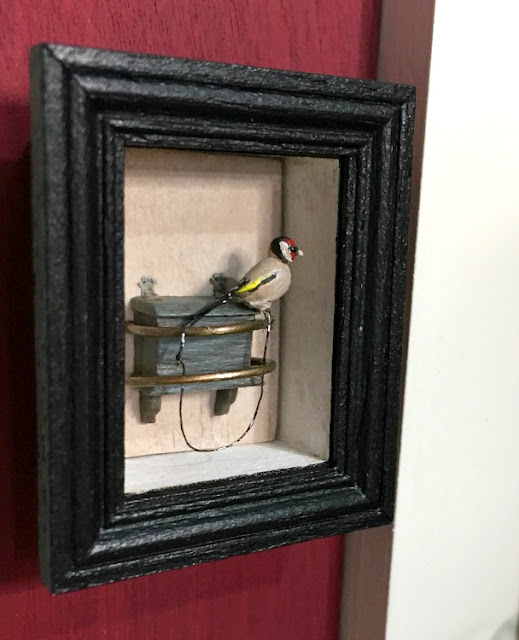 The talented Ilona made a fabulous 3D miniature version of the famous painting 'The Goldfinch' by Carel Fabritius (1654). Ilona meant to have the 3D image in front of the frame and just put it inside the frame to make sure it was safe during the trip home, but I rather like the deep frame with the bird inside, so for now I'm keeping it like this. The painter Fabritius died in a huge gunpowder explosion shortly after he painted 'The Goldfinch'. The explosion destroyed a large part of the centre of Delft and was so loud that it could be heard more than a hundred miles away. My ancestors of that period lived in Delft and I find it an intriguing thought that they experienced that piece of history first hand. I don't know whether they were hurt, or whether their house was destroyed or anything else, but just the thought of this thin thread connecting me to this somehow fascinates me. For other explanations of the symbolism of The Goldfinch, please check out the website of museum the Mauritshuis in Delft. The story of The Goldfinch is rather wonderfully shown on the website of the Mauritshuis (click here, sound on and scroll down). Wow! Your ivory and walnut box is absolutely amazing. What a miniture treasure, indeed. And I love your goldfinch and the way it is displayed. The shoes and handbag display shelves are a great idea. Can't wait to see them all. I saw you comment in my mailbox but didn't see it here. Found it in the Spam-box! Don't know why that happened. Yes I love all of my treasures. I'm always in admiration of the people who make all these little treasures. Beautiful scenes and miniatures Josje. I have wondered what you planned to do with all the gorgeous shoes and handbags you have collected. :-) Ton;y's vanity box is wonderful!!! I have a lot of ivory piano keys stashed away. I always wanted to make a comb, His is lovely! Yes the piano keys are a good resource of such a controversial material. I also have a big box of them in my attic, but have still to try and use them. I love the combination of ivory and silver, which I'm sure you could do! I am afraid I neglected to mention Ilona's wonderful depiction of the "The Goldfinch". What a brilliant idea to make it into a shadow box. It is just like the painting. She did a great job! I love miniature shadow boxes. I have planned a few with taxidermy pieces. Just like the old ones seen in English country houses. You mean like the ones by Walter Potter? I love those. Especially the one of the kitties playing lawn croquet and the one of the kitties having a tea party. There's two artists using taxidermy in their pieces which I quite like as well, some of it anyway. I almost bought one of their pieces years ago, still love that one, a combination of taxidermy and porcelain. Taxidermy is always controversial of course, but still intriguing. It's funny but in miniature I have pieces (of many different materials) which I would never buy in full size, either because I don't like the style or because I don't agree with the ethics of it. My most recent 'unethical' miniature purchase was a cheetah rug. Made from fibres of course. Yes those country houses are filled with great objects. A goldmine of inspiration. I look forward to seeing your taxidermy shadow boxes! I was thinking more like the type that had owls, pheasants or a fox. The back of the box usually painted with sky and a bit of wood/brush in the foreground. Those are the ones I usually see mounted on walls in old houses. Oh no, don't show Kilmouski! ;-) I think he'd appreciate scenes with mice. He may even help you with those! Yes I know the ones you mean. I even own an owl one myself. Full scale. He just sits on a cabinet, not on the wall. Has creado una preciosa escena con esos zapatos y bolsos. Preciosa la caja y el pájaro. Thank you Isabel. Happy Holidays to you too! Thank you Betsy. Yes I think the goldfinches were kept for their singing qualities, but why on a leash and not in a cage I don't know. I'm don't like to keep animals in cages (or chained up) at all, but in miniature everything is different. And I like the historical connections. Your collection and photos are beautiful! 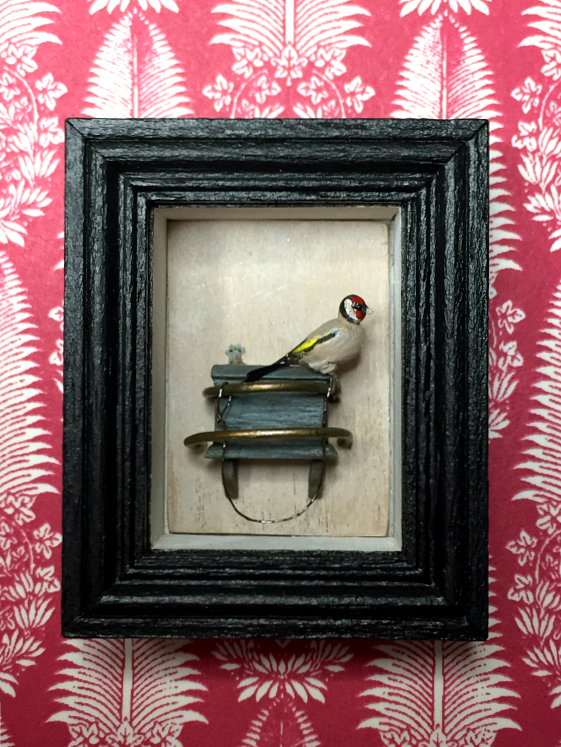 (though a chained bird is a little sad to me) the piece and the whole room is wonderful! Thank you Linda. Yes chained up animals are very sad to me as well. My chickens have to be kept in the coop now because of an outbreak of bird flu in the area, and even that is sad to me. They are used to roam about freely. Even sadder it would be if they'd all have to be put down, so this is the better option. Hopefully it won't be all winter. What a wonderful room with so many gorgeous miniatures. Love it! The pictures are fantastic. I love your solution for displaying the wonderful collection of shoes and handbags. It looks so elegant and I am sure would be any woman's, and several men's, dream come true. The vanity case is a masterpiece and the 3d painting is extraordinary. I love your collection! Je ne connaissais pas ce tableau, quelle bonne idée Ilona a eu de le faire en 3D, l'histoire du peintre et des vos ancêtres est originale. Thank you Jean-Claude. The painting is quite well known in the Netherlands, but I can understand you don't know it. I was very lucky to be able to get the vanity case from Tony. I love all the objects he made to go inside. The bottom drawer (not shown in the picture) has a fitted space for the ivory mirror. The perfumes and little picture in the ivory frame also came with it. Wow, Josje, jij hebt eens eventjes een mooie, chique collectie schoenen/tassen....in mini ;)! En zó, op die glazen plateaus, staan ze mooi tentoongesteld. The vanity box, gemaakt door Tony, is een absoluut staaltje vakmanschap. Tony is een true craftsman in het maken van dit soort miniaturen. Vooral als ik naar de accessoires, die bij de box behoren, kijk, ze zijn delicaat om te zien en zo precies in schaal gemaakt. Misschien zou je het Puttertje ook nog in de keuken kunnen hangen, zoals dat toentertijd gewoon was..? Ik moet er wel bij vermelden dat ik geen idee heb of het vogeltje ook fluit, dat deed hij hier niet... ;)! Ik wens jou hele fijne feestdagen en een gezond, creatief en goed 2018! Haha Ilona, nou dit puttertje heb ik nog niet horen fluiten, maar ze kunnen het wel goed. Ik heb hier ook bijna ieder jaar een paartje puttertjes in de tuin, zo leuk! Je moet echt even op de website van het Mauritshuis kijken, daar staat heel veel info op, o.a. over het houden van die vogeltjes en hoe handig ze zijn. (puttertjes die hun waterbakje aan ketting omhoog trekken om te drinken b.v. Dat heb ik wel de slimme kraaien zien doen met vetbollen aan een touw, maar andere vogels nooit.) k ben er erg blij mee Ilona en misschien hang ik 'm nog wel buiten de lijst een keer. In de keuken komt 'ie waarschijnlijk niet. Maar wie weet, niets veranderlijker dan een mens, nietwaar? Jij ook fijne feestdagen en de beste wensen voor 2018! Your collections are utterly fascinating Josje and ALWAYS top drawer! The shoes and handbags are dreamy and what woman wouldn't want to wake up every morning and be greeted by the sight of them. 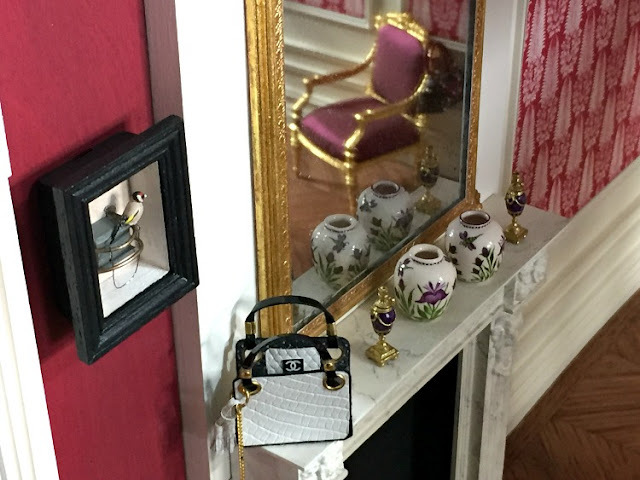 The travel case is indeed INCREDIBLE but my favorite thing is the goldfinch in the shadow box- I LOVE the way the composition is framed and the way it looks against the red wall- simple but Elegant just like the CHANEL bag on the mantle. Oh I know, I know Elizabeth! I have taken the perfume away immediately, but it looked so good for the photo ;-) I won't do it again. Thank you for your always lovely comments, Happy Christmas and a Wonderful 2018! What an amazing collection!!! It's a dream. Thank you Geneviève! I am so happy with all of my pieces, couldn't pick a favourite! Happy Holidays! Thank you Catherine! I agree ;-) Happy Holidays! Your room is beautiful and I like your solution for displaying shoes and handbags. I don't like the picture of the little bird though, it makes me feel sad. Hello Polly, yes I can understand it makes you sad. We wouldn't do that anymore now of course! For me the 3D picture is a link to the memories and links I have with the original painting. vous avez une très jolie collection . que choisir ? cet oiseau dans ce tableau est incroyable . moi , je craque pour les deux poterie sur la cheminée . leur teinte est rare . on ne voit pas beaucoup cette couleur . ils sont très beaux . j 'aime beaucoup découvrir les objets que vous mettez petit à petit dans votre maison . ils sont toujours très rafinés. Hello Catherine, well I couldn't pick a favourite anymore from my collection. There are so many pieces I absolutely love! It amazes me time and time again how many beautiful things are made by miniaturists, and what we see or own is only a tiny, tiny fraction of what exits. The pots on the chimney are made by Cocky Wildschut. It is a beautiful colour isn't it? I also love the little dragonflies on them. I bought them especially for this bedroom, long before I started work on this room. Thank you Catherine and Happy Holidays to you!